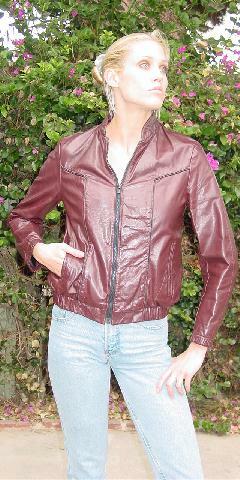 This vintage deep burgundy wine Wilson's leather jacket has a V yoke in the back with an elastic waistband. There are black leather cord accents extending upward from the waistband and going diagonally to the sleeve seams. There's also one going around the band collar and below the back V shaped yoke. 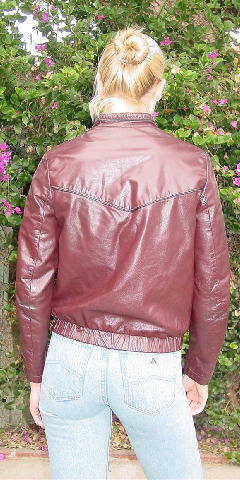 There is minor loss of color by the stitching of the zipper and by the stitching adjacent to the cord accent on the left side. There is a 5/8" scrape near the outside bottom of the right sleeve. Think of the backup dancers in Michael Jackson's Thriller. It belonged to a model, but it's too tight for her now. shoulder to hem 21 1/2"